The Land Down Under has always played a big role in the progression of Gawad Kalinga. GK Youth Australia and other Australian volunteers have been helping build GK communities year after year, and to date Australia has already sponsored 28 GK villages in the country. Australian volunteers have also been going to Papua New Guinea, where they have sponsored one GK village. 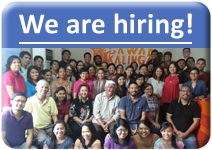 This only goes to show that there is a huge opportunity to make Australia the base for Gawad Kalinga’s work in Oceania, so in the early part of 2011, GK Australia was established as a separate entity. Gawad Kalinga is about caring for the poor and treating them like family, and GK Australia hopes to explore how this model can apply to the disadvantaged communities in their territory. Just as it has done much to alleviate poverty and restore dignity in the Philippines, the GK template could prove to be effective in providing marginalized groups (particularly the Aboriginal and Torres Strait Islander communities) with a way to escape poverty and welfare dependence. By establishing GK Australia as a separate entity, the opportunity to expand GK’s work is now made bigger. Many more Australian volunteers and anti-poverty organizations may now be tapped to join Gawad Kalinga in the vision of ending poverty in the Philippines and in other parts of the world.